We are pleased to release the 3rd edition of our Arresting Justice report. Since 2011, we have published data about juvenile arrests in Chicago. Today, we share juvenile arrest data from 2013 and 2014. The number of juvenile arrests decreased by over 17 percent from 2013 to 2014. Since 2009 when we first began analyzing these numbers, juvenile arrests have decreased 43%. While Blacks represent 37% of the 0-17 youth population, they accounted for over 79% of juvenile arrests in Chicago in 2013 and 2014. While Latin@s represent 40% of the 0-17 youth population, they accounted for over 18% of juvenile arrests in 2013 & over 17% in 2014. Males were over 83% of juvenile arrests in 2013 & 2014. In 2013 & 2014, 15 to 17 year olds accounted for over 80% of juvenile arrests (they represent 16.6% of Chicago’s youth population). Most juvenile arrests were for misdemeanor offenses in 2013 & 2014. The top three in 2014 were miscellaneous non-index offenses, drug abuse violations and simple battery. Based on the data, in 2014, 48.3% of juvenile arrests were referred to court while 19.1% resulted in detention. 25.4% of juvenile arrests resulted in informal station adjustments and 3.85% in formal station adjustments. Download a visual summary of the report HERE. Thanks to our friend Dan Cooper at the Adler School, here are some maps of 2013 & 2014 juvenile arrests in Chicago. According to CPD, there were 17,783 juvenile arrests in 2014; down from 21,496 in 2013 (a decrease of over 17%). Since 2009 when we first began analyzing these numbers, juvenile arrests have decreased 43%. The 21st district merged with the 2nd in March 2012, the 23rd district merged with the 19th in 2013 and the 13th district with the 12th at the end of 2012. 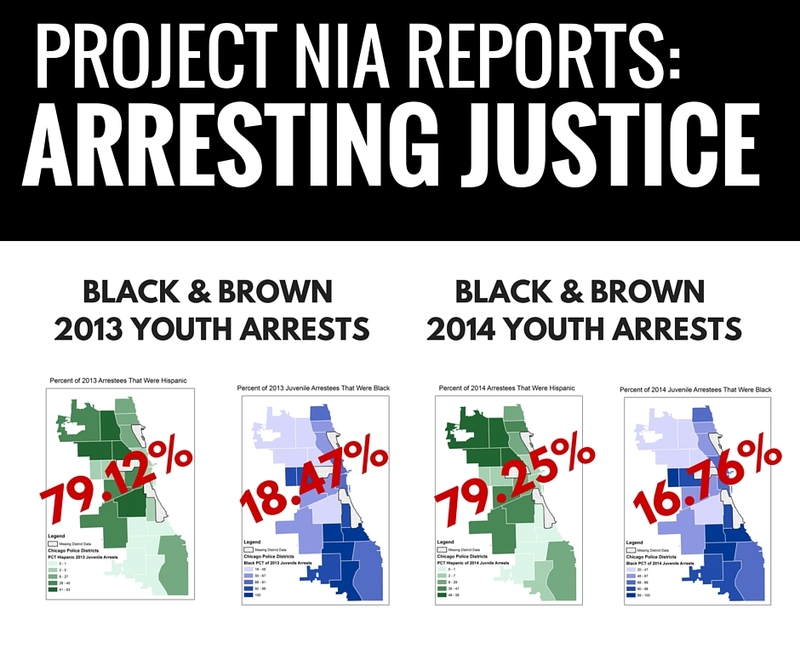 In 2013 and 2014, Black children & youth comprised over 79% of juvenile arrests in Chicago. Black juvenile arrests outpace all other groups in each district except for the 17th and 25th districts. A closer look at rates of arrests, however, reveals that Black juveniles are disproportionately targeted in these districts too. For example, Black juveniles represent 3.8% of the youth population in the 17th district yet they comprise 27.8% of arrests in 2014. White Hispanic juveniles represent 57.7% of the youth population in the 17th district and comprised 56.5% of arrests in 2014. The same pattern holds in the 25th district where white Hispanic youth represent 76.5% of the youth population and 57% of juvenile arrests. In both districts, white Hispanic youth are arrested at or below their population. Black youth are arrested disproportionate to their population in both districts. Blackness is the determinant factor of juvenile arrests in Chicago. The Illinois Juvenile Justice Commission put together a helpful handout that underscores disproportionate minority contact in the juvenile justice system at the national, state and county levels for calendar year 2013. 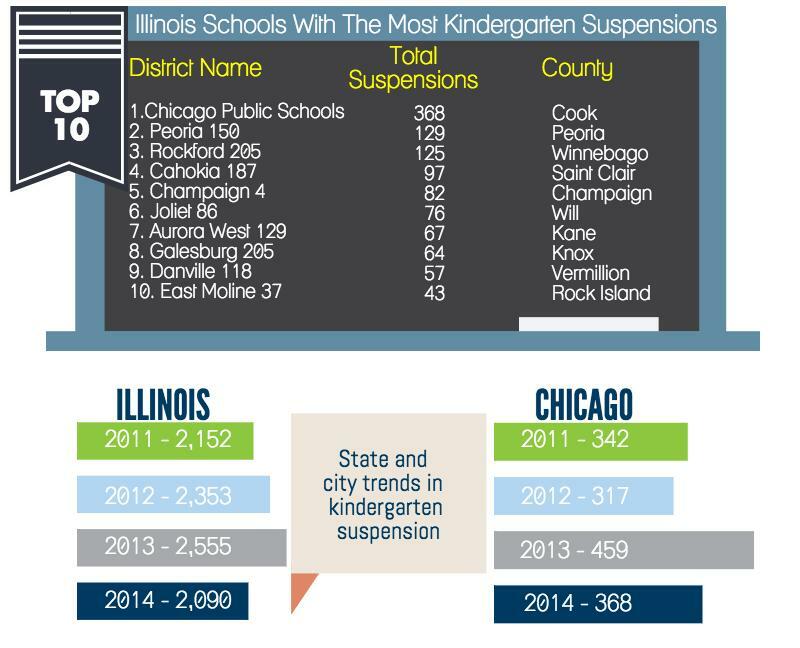 More than 2,000 kindergarten suspensions were recorded during one school year in Illinois. See the report HERE. The raw data from the report is HERE. Suspension rates in Chicago Public Schools have declined markedly but still remain very high, particularly among the system’s most vulnerable students. In the 2013-14 school year, 16 percent of CPS high school students received an out-of-school suspension (OSS), down from 23 percent in 2008-9. Still, 24 percent of high school students with an identified disability and 27 percent of high school students in the bottom quartile of achievement received out-of-school suspensions in 2013-14. Suspension rates for African American boys in high school remain particularly high, with one-third receiving at least one out-of-school suspension. Suspension rates are strongly related to students’ prior test scores, their race, and their gender. African American students are much more likely to be suspended than students of other races/ethnicities. Suspension rates are particularly high for African American boys in high school. About one-third of African American boys in high school (33 percent) received an OSS in 2013-14. In comparison, 13 percent of Latino boys in high school and 6 percent of white/Asian high school boys received an OSS in 2013-14. African American girls also have high OSS rates in high school, at 23 percent in 2013-14. This compares to high school OSS rates of 6 percent for Latina girls and 2 percent for white/Asian girls. The decline in high school OSS rates has been accompanied by a doubling of in-school suspension (ISS) rates among African American high school students. In the 2013-14 school year, 15 percent of high school students received at least one in-school suspension, up from 11 percent in 2008-09. Thus, the rise in in-school suspensions is counter-balancing the decline in out-of-school suspensions. In-school suspensions are given more frequently to African American students than students of other racial/ethnic groups. ISS rates nearly doubled for African American high school students between 2008-09 and 2013-14, but remained the same for other student groups. Read the full report. Read an article about the report here. The Illinois Department of Juvenile Justice publishes monthly data about the population in its youth prisons. You can read August data here (PDF).